Just watched the Feb. 23 episode titled "Lighthouse," and it's a solid follow-up to last week's epic episode. Considering the blockbuster nature of last week, that's saying a lot. Just finished watching the Feb. 16 episode of Lost and what else can I say? The title of this blog says it all. This blog entry likely contains spoilers. But if you really wanted to see this movie, you probably already did. I only used one tissue during "Dear John" because there's only one scene I found emotional enough to warrant it. The beginning of the movie was too forced. John (hunky Channing Tatum) and Savannah (sweet Amanda Seyfried) fall in love instantly. Like, within the first three minutes of the movie. During their first date, a very brief encounter with someone John knew in his past is supposed to convince us that he's the bad boy -- except these actors are either terrible or poorly directed. That night, after they've known each other for 24 hours, Savannah decides she wants to meet John's dad. And she immediately is able to engage in conversation with him and discover what it is that has prevented John from doing so for the past 10 years. Either I don't remember the fast pace from the book, or the writer/director tried to keep too much detail in the adaptation and had to sacrifice in the beginning to keep more in the end -- or a lot from the beginning ended up on the cutting room floor. The best part about "Dear John" is the strained father-son relationship and John's attempt to mend it when it's too late to matter. The only importance the girl has in all this that is she is able to point out to John why his dad (Richard Jenkins) acts the way he does. After that, I don't care about her part of the story or her relationship with John, and the movie focuses too much on it. I have so many problems with Savannah, anyway. She gets mad that he wants to re-enlist in the Army after the Sept. 11 terrorist attacks. She stops communicating with him for months before writing him a "Dear John" letter. He comes back to visit several years later and she's mad that he's not fighting to win her back. This girl is unbelievably selfish, but she hides it well under the guise of her no-drinking, no-smoking, no-swearing, building-a-house-for-a-family-in-need exterior. The writers and director couldn't appear to find a climax in the movie because several times it seemed like it was supposed to end but didn't. So instead of having several events lead up to one big moment, the several events led to several moments that gave way to several more moments, but no big plot twist or I-need-a-box-of-tissues events (but, maybe that's because I had already read the book and knew how it was going to turn out). They seemingly have tried to bill this movie as a sad love story, with soulmates separated by war. But in reality, it's a lonely guy who meets a beautiful girl, whose only importance in his life is that she shows him why his dad is distant and consequently motivates him to understand and salvage the deteriorated relationship that remains between the men. And watching two grown men cry in a hospital because they've finally learned how to say "I love you"? Nothing will tug at your heart more than that. Roger Ebert gave the film two stars. So did The Associated Press. Mark me down for another two; it's really not worth any more than that. Fans of the horror genre will be satisfied, not wowed, with "The Wolfman," which opens Friday, Feb. 12. Fans of the 1941 original classic starring Lon Chaney Jr. had better be prepared for a Wolfman like they've never seen before. This version is violent and bloody to an extreme. Director Joe Johnston shows us the creepy Benicio Del Toro as Lawrence Talbot undergoing his gruesome transformation into a werewolf, but it's all done with CGI, as expected. Moviegoers shouldn't be surprised or critical. If you love monster flicks, you'll love the special effects. Still, I went into the screening with the hope it would rekindle the feeling I had when I first saw Francis Ford Coppola's masterpiece "Dracula" in 1992. It didn't. Trailers for "The Wolfman" really got my juices flowing, but the finished product wasn't the hit I was expecting. In many respects, Johnston stays true to the roots of the original, but a major unexpected plot twist will surely raise some eyebrows. Also, the 90-minute running time doesn't allow much character development and the film seems a bit rushed. With Anthony Hopkins also on board, at times if feels like he and Del Toro are in competition for the creepiest character of the year award. All that being said, if you're a horror fan and love the classics, you'll be entertained with "The Wolfman." - Another 'Wow!' ending to an otherwise blah episode titled, "What Kate Does." Claire, who's been missing since last seen with Christian in Jacob's cabin, popped up as an innocent bystander during Kate's get away in a flash sideways at the end of the season premiere. Well, well, well. What a different story at the end of the Feb. 9 episode. A edgy-looking, rifle-bearing Claire saves Jin from the clutches of two members of the Others. Good stuff, but what's up with Claire? Where has she been? Has she been living solo on the island? - Another Claire question: What does temple master Dogen mean when he tells Jack they must stop Sayid's darkness growing inside him, aka "the infection," similar to the one his sister has? Maybe everyone jumped the gun last week assuming Jacob had taken over Sayid's body. - Surely you noticed Claire's doctor, Ethan Goodspeed, in the L.A. flash sideway, didn't you? Yes, the same Ethan we first saw in Season 1. - Another minor Claire note: On a scale of 100, I give a 1 on the believability scale Claire would get back into the car after Kate returns her bag in the L.A. timeline. Poor writing. - Was disappointed there was no Locke, Ben or Jacob this episode. That could be the one drawback of the final season, too many storylines at once to cram all into a one-hour show each week. - Another question was answered when Kate tells Sawyer why she wanted to return to the island. It was hardly a question I needed answered, though. - Even though I was underwhelmed by episode 2, there were enough revelations that will most likely prove instrumental to the series' conclusion, the most obvious being the appearance of Claire on the island. How in the world did they do it? How? How? How? I just don't get it. Don't take these questions as criticism. I was absolutely fascinated by ABC's two-hour premiere. Seriously, though, how can we possibly have even MORE questions than answers after Round 1 with 15 more to go. I'm emotionally spent and completely confused. I love it. Episode 1 came out swinging with Jack and Co. on the plane en route to Los Angeles. Jack's plan worked! Then the haymaker. There's no crash landing, rather a scroll down to the fathoms of the ocean and a glimpse of the island in ruins at the bottom of the ocean floor. Perhaps it's the aftermath of Jack's plan coming to fruition. What about Sayid coming back to life? Is he the new Jacob? Why was Desmond on the plane? A nice twist. What about the new Locke and his split-smoke monster personality? Riveting stuff. Where's Jack's father's body? Good luck figuring out that one. Where is the man in black's home? Um, who knows. There's one huge question left though, one I suspect we won't get answered until the end of the series. Where exactly are Jack, Sawyer, Kate, Hurley and the rest? I suspected alternate universes or parrallel worlds after season 5, but certainly not the main characters existing in both at the same time. At least that's what appears to be happening - one in which Oceanic 815 never crashed and another that continues the story of the past five seasons. Will these timelines somehow intersect at the series' conclusion? Considering what we saw in the season premiere, it's anyone's guess what's really happening in the Lost world. The Academy Award nominations came out Tuesday morning, and the big winners were the modern war drama "The Hurt Locker" and the futuristic, special effects-laden "Avatar," with nine nods apiece. Talk about two different movies. 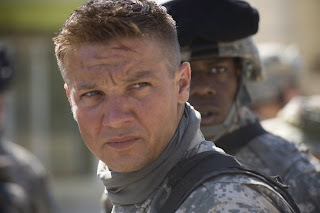 Sure, both have their share of drama and violence, but "The Hurt Locker" is a relatively small, story- and character-driven movie that played at the Cedar Lee Theatre earlier this year, while "Avatar" is running rampant and most theaters -- in 3D and 2D at some -- and hangs its hat on visuals (certainly not storytelling and characters). Thanks to their various strengths, they are both really good, arguably great movies, and I don't think I'd have a problem with either winning. That said, I still think I would give the nod to Quentin Tarantino's unusual and fascinating "Inglourious Basterds." It may not be the director's best work -- I fear Tarantino never will top "Pulp Fiction" -- but it boasts some great filmmaking. I think about the movie's extended, tension-drenched opening sequence constantly. To be fair, I haven't seen two of the 10 films nominated for best picture: "The Blind Side" and "An Education." I have little interest in the former and simply missed the latter. I will have to catch both soon, though. (I'm no fan of 10 movies being nominated -- as I see it, it's just a way for five more films to put the honor on their DVD covers -- and the fact that I have more movies to cram into my schedule by March 7 isn't helping matters. Truth is I have lots of catching up to do in the major categories. So take the following quick list of picks with a big ol' grain of salt. I'll have choices I feel better about on the day of the Oscars in The News-Herald. Best actor: Jeff Bridges, "Crazy Heart." Supporting actor: Christoph Waltz, "Inglourious Basterds." Best actress: Gabourey Sidibe, "Precious." I'd write more, but I have movies to watch.